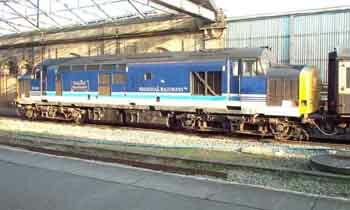 After hauling the "last" Coastline service train on 30th December 2000, 37429 "Eisteddfod Genedlaethol" was sidelined for a "B" exam prior to going back on the coastal passenger runs when required. The first day out after the exam was a disaster when the loco dumped several hundred gallons of fuel onto the track due to a leak. Today it failed again, this time with brake problems, and was seen being dragged Eastbound through Prestatyn by "Thunderbird" locomotive 47705 "Guy Fawkes", later to appear at Crewe. 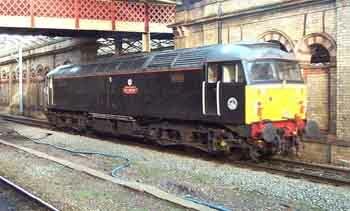 I met it at Crewe around 11.30, the following photographs record the arrival in contrasting light. 47705 "Guy Fawkes" entering the platform 12 loop with coaches 4902 (leading), 35453, 5029 and 5025. 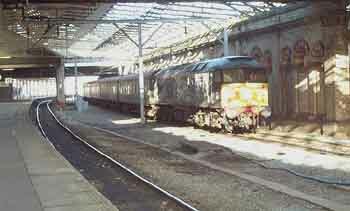 37429 "Eisteddfod Genedlaethol" is dead at the rear. 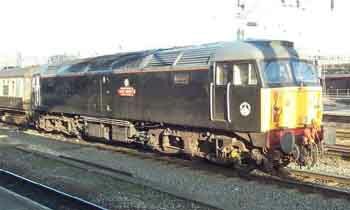 47705 looked good as it basked in the sunlight waiting for green. 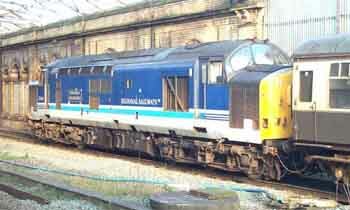 Somebody had been giving 429 a wash during its "B" exam and it looked much more presentable as a passenger machine, it is an attractive livery but does not suit the GWR colours of the stock. 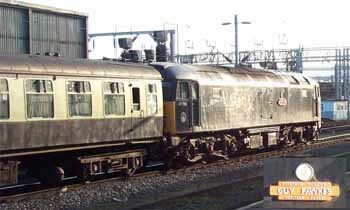 Another side shot, it is not often that there is the opportunity to take full side shots of these locomotives, particularly in bright sunlight, so I capitalised on the situation. This one looked so much like a model. A little over exposed perhaps but it relates the scene. 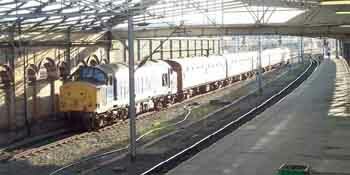 47705 later returned to Chester in light engine mode leaving 37429 at the carriage sidings with the stock. Let's hope it is nothing serious.